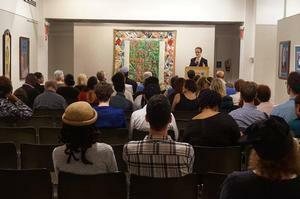 A few hours after Swann Galleries’ September 15, 2015 auction of the Maya Angelou collection, the writer and CUNY professor Michele Wallace reflected on the sale. She attended with her mother, Faith Ringgold. I had never attended a high-end art world auction before on the East Side of the Apple, much less sat in the front row with the artist (my mom) whose work was the high profile piece of the afternoon. It was very exciting — the situation, adrenaline packed, with lots of glamorous, young people arrayed around the room on cell phones, computers and land lines bidding real money for real masterpieces of African American art from the collection of Maya Angelou. Almost every piece was something I admired and desired: a series of stunning watercolors by Romare Bearden, a fabulous rarely seen lithograph of the John Brown series (c. 1970) by Jacob Lawrence, numerous prints by Elizabeth Catlett, each more beautiful and serene than the next, a work by Samella Lewis, lots of John Biggers, a signature sculptural work by Mel Edwards, as well as the portrait story quilt by Mom commissioned for Maya Angelou’s birthday in 1989. This was just six years after Faith had essentially invented the form associated with the story quilt when she made her first, “Who’s Afraid of Aunt Jemima?” the only one out of the 130 to follow that she has ever made entirely by her own hand. One of the delights of the day was the substantial African American attendance and that blacks did much of the bidding and buying since we are not ordinarily known as a group for our attention to African American visual art. In our defense, however, Swann Auction Galleries is the first major auction house to take African American art seriously as a market and a category.It may be hard for the other houses up until now, which have been caught in the middle of an irresolvable dilemma as to whether to recognize and acknowledge such a thing as "African American art." Neither the art world market as presently constituted nor African American artists, themselves necessarily want to be identified with the field. 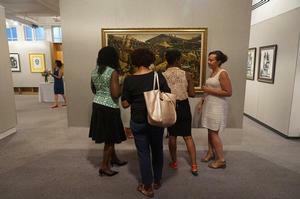 Personally, I feel that while African Americans are not monolithic, the category of African American art is a necessity to the future fortunes of the market for their art as well as the clarification of their role in the history of American art. This category does not preclude their art from simultaneously being recognized in other ways that have nothing to do with racial identity. Viewing the 40 lots in Swann Galleries' Maya Angelou collection auction, I could envision Michele Wallace’s words like a mortar cementing the connections between artists who share even more than racial identity, they represent friendships which are like extended family. The connections of course extend to the IRAAA and probably out to many of the people reading this piece. More about that aspect in a moment. But first, the market aspect which was — in one word (borrowed from a famous Angelou poem) — phenomenal! 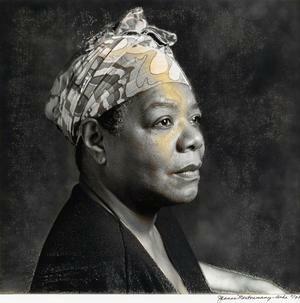 Nearly every work sold for about twice its estimated price and some fetched many times more — for example, Jeanne Moutassamy-Ashe’s photo of Maya Angelou, estimated at $1,000 - $1,500, commanded a final price of $17,500. One of the factors behind this soaring market is that a romance of African American art is forming and becoming a part of a larger narrative. 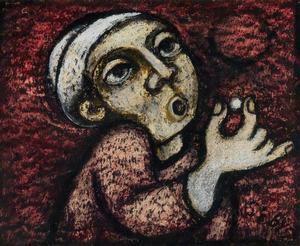 A romance in the sense of the epic narrative encompasses European and Euro-American art. We all know the legendary stories of passion, heroism, addiction and abandon, and tragedy comprising the romance of Western art: Michaelangelo’s Sistine Chapel, Van Gogh’s ear, Picasso’s mistresses, the interaction of Jackson Pollack’s action painting and alcholism, the over-the-top pop art that was also Andy Warhol’s life, etc. In the romance of African American art, Jeanne Moutassamy-Ashe is the intriguing, beautiful, reticent artist who eschews celebrity while representing the extraordinary triumph and great tragedy of her late husband’s life. Jimmy and Maya, Maya and Oprah, Maya and Richard…. 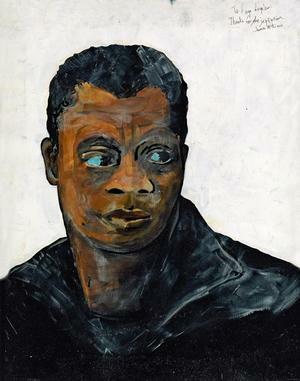 When I saw the lovely untitled Charles Sebree work (Boy with Pearl), I wondered if its acquisition by Angelou had anything to do with her very close friendship with the cultural historian Richard A. Long. Long (also a Sebree collector) was a very good friend of the literary scholar Eleanor Traylor who owns a number of Sebree works and knew the artist well. Richard A. Long and Maya Angelou became advisors of the IRAAA print journal when Samella Lewis published it. 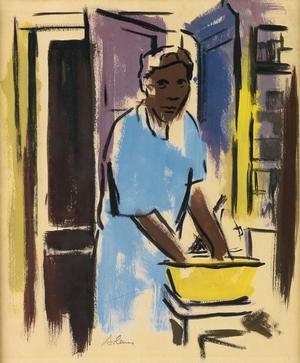 It’s not surprising that the Angelou’s association with Samella Lewis extended to her collecting a strong, early-career painting by Lewis, Washerwoman (1947), as well as a Lewis lithograph. Exemplary paintings from Lewis' formative period seldom come on to the market. 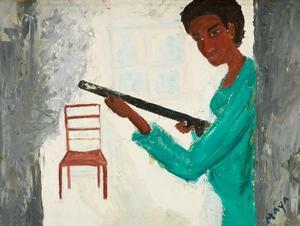 Samella Lewis occasionally was involved in the transfer of works from her good friend Elizabeth Catlett to public and private collections. The presence of five exemplary Catlett lithographs in Angelou’s collection probably are underscored by stories of Catlett-Lewis-Long-Angelou friendships. When Hampton University took over the publication of the IRAAA journal, I was more hesitant to reach out to Angelou (though her secretary) than to Richard Long who was more more accessible. However, without hesitation I did ask Angelou to provide statements about two of her visual artists friends when they passed — Selma Burke and Tom Feelings — and she graciously consented to do so. Seeing Tom Feelings drawings in Angelou’s collection reminded me of their friendship and her eloquence in remembering him in our journal. Feelings and Angelou met in Ghana in the early 1960s. Tom Feelings’ Lady B is a portrait of Angelou's mother, Vivian Baxter, whose nickname was "Lady B." The estimate for the portrait was $1,000 - 1,500; the final price was $4,750. 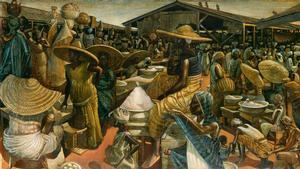 Maya Angelou and her friend John Biggers shared formative experiences of being in Ghana around the same time. Biggers’ magnificent 1962 painting Kumasi Market was a stand-out in Angelou’s collection and at auction as well, going for a final price of $389,000. 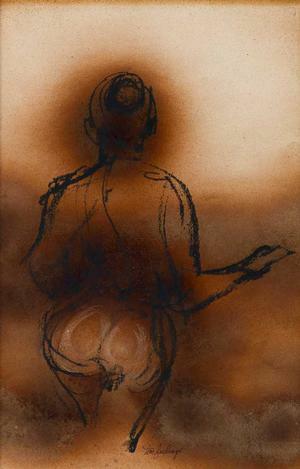 Angelou also owned a conte crayon drawing by Biggers which fetched a final price of $37,000 and three Biggers lithos which all sold well above estimate. One of the most surprising pieces in the show — and the only one that did not sell —is a painting by Angelou, herself — an oil called Protector of Home and Family. It was painted in the winter of 1969 at the height of the black power movement. Not only a statement about the militance of that time, it also begs a question. Why is this black woman defending her family alone? 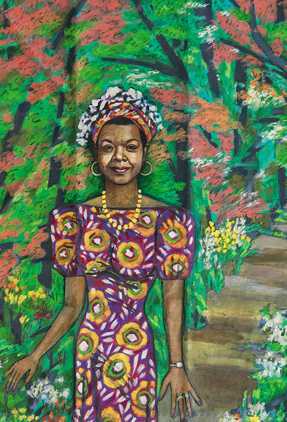 Was the painting informed, at some level, by Angelou’s own experience as a single mom? She was single for much of her life, but never alone. 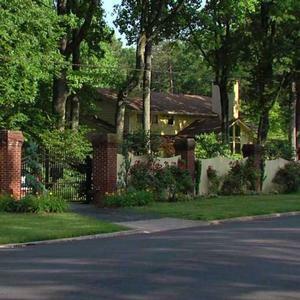 Generous hospitality is one the reasons why Maya Angelou was regarded by many as an extraordinary friend. Angelou loved to cook for her guests and was the author of two cookbooks. Viewing her collection one can easily imagine the sensory pleasures to be had at her Winston-Salem and Harlem homes: sumptuous food, great conversation and outstanding art. That the art sold so well is the icing on the glorious feast that was the life of Maya Angelou. 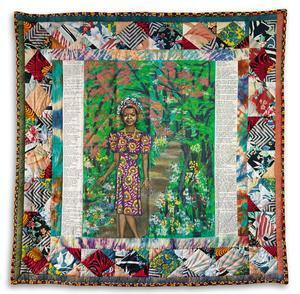 View the catalogue of the Maya Angelou collection and auction details here. 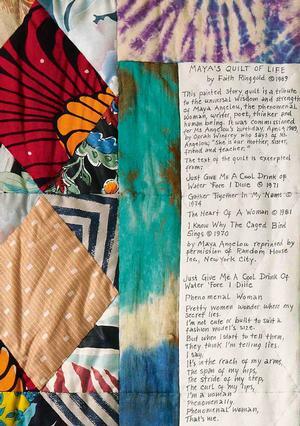 Postscript: Faith Ringgold's Maya's Quilt of Life was purchased at the auction by the Crystal Bridges Museum in Arkansas, Angelou's native state.